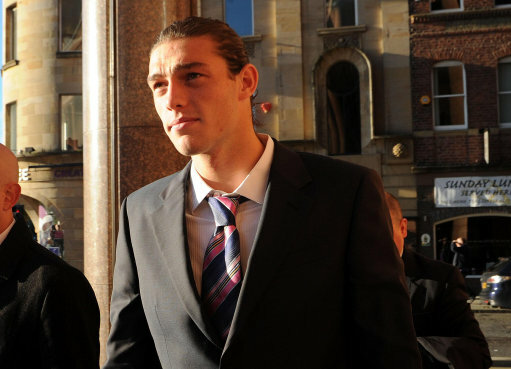 Newcastle ne’er-do-well Andy Carroll has been fined £1000 after admitting to assaulting a man in the city’s Blu Bambu nightclub back in December of last year. Despite initially claiming that the glass had accidentally fallen out of his hand whilst he attempted to throw his Vimto into defendant Michael Cook‘s visage, Carroll eventually pleaded guilty to common assault and was therefore fined and ordered to pay an additional £2,500 by way of compensation at Newcastle Crown Court. Carroll’s current landlord, club captain Kevin Nolan, has been advised to leave his car in the garage and bus it to training for the next few weeks. About time he starts playing for England. He’ll blend in quite nicely with Signor Merk, JT and Cashley. Ollie there is no “despite originally claiming” about it, the judge accepted his story for “accidentally” throwing his drink at him.